DeSilva+Phillips client Annie’s, a leading special interests publisher, has acquired Country Sampler, Illinois-based publisher of Country Sampler and Smart Retailer magazines, from Emmis Communications. Annie’s publishes magazines and books serving the crafts and nostalgia markets, including Creative Knitting, Crochet!, Quilter’s World, CardMaker, Crochet World and Good Old Days, with a strong subscriber base and presence on newsstands and in retail stores across the country. The company is part of the third-generation Muselman family business based in Berne, Ind., near Fort Wayne. Country Sampler has helped define country décor for almost 30 years. An all-in-one resource for home decorators, the magazine features a combination of country lifestyle articles and a complete catalog of decorating products from artisans in richly illustrated issues that include room-by-room house tours, tips from decorating experts and insights into collectibles and antiques. Original folk art, reproductions and classic country collectibles and furniture are displayed in authentic room settings. In addition to its magazine business, Annie’s also has four catalogs, a dozen membership clubs and offers thousands of download products, including digital versions of its magazines and online classes. The company showcases its products on more than 40 websites. Annie’s made its first foray into television a month ago with the addition of Candice Jensen Productions, producers of the Knit and Crochet Now! television show. Emmis, based in Indianapolis, has a national footprint in radio and magazines with 17 FM and two AM radio stations, and six city and regional magazines titles, including Texas Monthly, Los Angeles Magazine and Indianapolis Monthly. 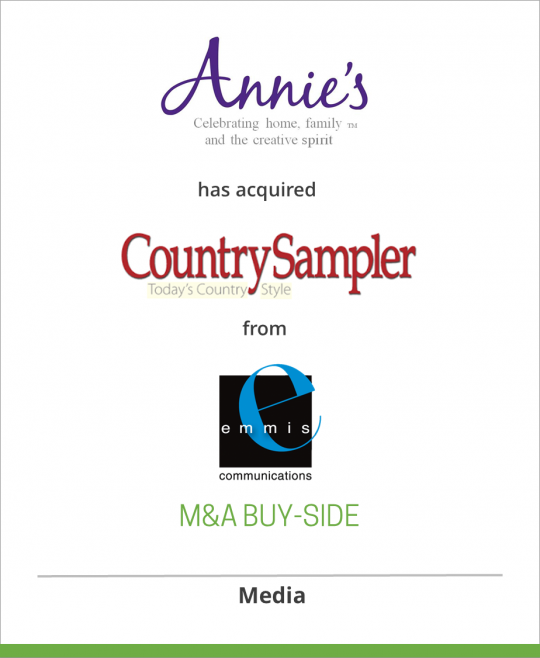 Country Sampler has been owned by Emmis since 1999.